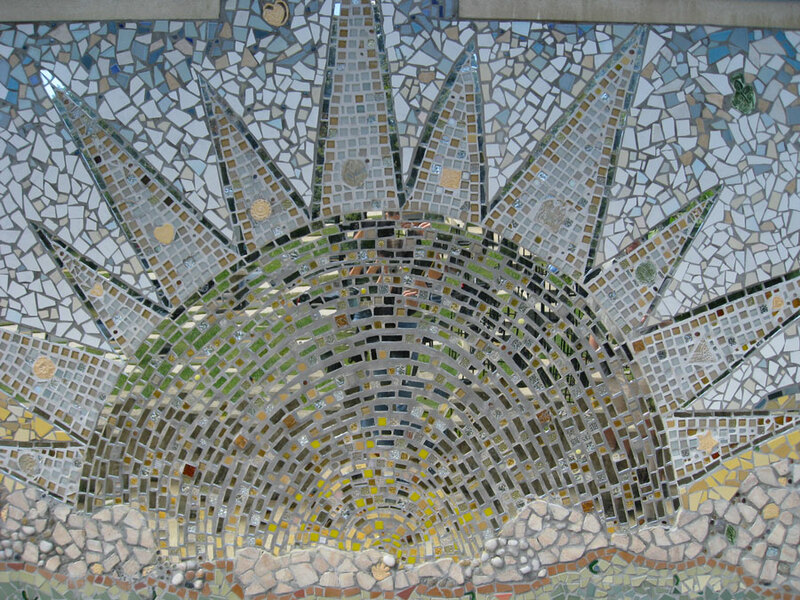 A mosaic sun brightens the cloudiest days at the Takoma Park Community Center. There’s a gentle mist falling outside on this cool September day. It’s not the steady rain the garden needs, barely enough to soften the air, lower the temperatures, and dampen the birdbath. But it’s a soothing kind of benediction after the bright sun and insistent breeze of the last few days. The tiny drops hardly make a sound as they fall. It was a quiet summer here in D.C.. After last summer’s record-breaking heat and dramatic derecho it’s been kind of a surprise to have so few crashing thunderstorms. Perhaps Mother Nature felt She’d made her point last year. The memorable moments of each season, each year, hold our attention only until the Next Thing comes along. We are creatures of limited attention spans, and easily diverted by shiny spectacle and the continuous rain of catastrophic events around the world. The work of repairing and renewing is constant. Some lament the loss of what cannot be restored. Others see new possibilities in every change. The ability to rebound after loss or injury is one of humankind’s most encouraging qualities. I love it when people don’t fold in the face of adversity, or stop learning after they leave school, or stop caring after their hearts get broken. Sometimes beauty is born from wreckage. Not long after I moved to Seattle I read Stephanie Kallos’s wonderful novel “Broken For You.” The story, with its Seattle setting and compelling characters, deals with the difficulty of recovering from tragedy, a common enough theme in much literature, but the way Kallos used the medium of mosaic art as a metaphor for transformative healing really spoke to me. 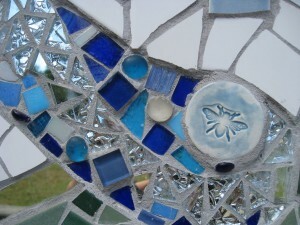 All my life I’ve been drawn to mosaic works, especially those which breathe life and beauty into otherwise drab surfaces. In Philadelphia, for instance, whole blocks have been transformed by the quirky thought-provoking mosaic murals of artist Isaiah Zagar. Using broken bits of mirror, ceramic and glass to create uplifting designs in formerly neglected inner city neighborhoods, Zagar was a pioneer in the field of public art made by and for the people, unsubsidized by government or corporate sponsors. Such gifts of beauty, produced by the patient process of putting together tiny pieces of color to make something hopeful and inspiring, help us to heal and deal with the continual barrage of violence that threatens our world. It can be a little overwhelming sometimes—the hurricanes, the floods, the crazed gunmen. The instinct to run and hide is strong, and perhaps vital to our continued existence. But just as vital is the instinct to pick up the pieces and rebuild, to reach out to the hurt and lost and help find the way to a brighter day. Humanity is a big puzzle. Sometimes it’s hard to know where you fit in. Sometimes you have to step back to see the big picture. And other times you just have to start by picking up a little piece and doing what you can where you are. Pull yourself together and brighten the corner you're in.